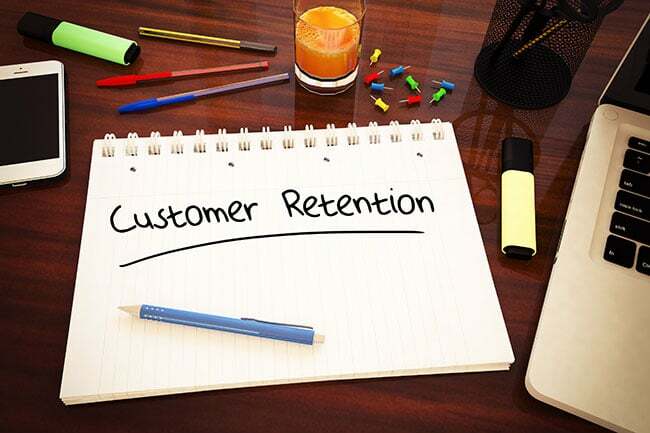 Simply put, customer retention rate (CRR) is the number of customers you manage to keep over a certain period. It measures loyalty, continued interest and customer service – three key elements to any successful business. Customer retention is crucial. It makes use of what you already have rather than splurging on large marketing campaigns as a way to bring in new customers to replace the old. Your CRR is the base for building on existing relationships. Customers now demand a more engaging and personalised experience, and companies must respond accordingly to nurture them into advocates. What’s the point in spending all that money to attract new customers, only to lose them after the first interaction? Despite the importance of CRR, retention marketing has traditionally taken a back seat to acquisition efforts, as demonstrated by the fact that customer retention usually has a much smaller budget allocation. Most companies take a “one-size-fits-all” approach to customer retention, but according to Jerry Jao, founder and CEO at Retention Science, companies are now beginning to take notice of this determining business tactic. Having founded two companies focused on increasing customer engagement and retention, Jao is noticing a clear shift in priorities and says many marketers now realise the need for growth in customer retention. In a recent Retention Science study, 70% of marketers said their retention marketing is average at best, but all showed eagerness to improve it. According to Gartner Group, 80% of your company’s future revenue will come from just 20% of your existing customers. And Adobe reports that for each 1% of online shoppers who return for a subsequent visit, overall revenue will increase by approximately 10%. This means if online retailers were to retain just 10% of their existing customers, their revenue would soon double. So how do you turn your focus to building your CRR? In order to build on your customer retention rate, you must first come up with a strategy. There are five main phases for developing a strategy. Companies that put data at the core of their marketing and sales decisions can significantly improve marketing ROI. In fact, a survey published on HubSpot revealed that making data the core of your strategy can improve ROI by up to 20%. Poor customer service is the most stated reason for people leaving a business, so this is where your data should start. Monitor staff behaviour and reaction times, product knowledge and incentives and anything else that might be turning customers away. Forget about yourcompany for a minute and instead focus on the companies you do business with. What makes you stay? What makes you feel that they care about you? What attempts do they make to collect your feedback? What incentives do they give you to stay loyal? Customers want to see that you care about their decision to leave you, and the reality is, you should. Asking the simple question, “Why did you cancel?” gives you valuable feedback, no matter how hard it is to hear. An exit survey can provide you with extra insight as to how you can improve your product, your service or overall offerings. You can also use this information to construct a recovery campaign later down the track, which if done well, can see old customers come pouring back. A great example of involving your customers in future improvements comes from the guys at Moz.com. Their “feature requests” forum allows customers to freely start a conversation about what they’d like to see, and the team can not only become part of that conversation, they can use it to both validate their customer’s sense of value while collecting some ingenious ideas and suggestions for free. Why work off guesswork when asking for help strengthens your customer relationships? A loyalty program might seem like a no-brainer, but surprisingly, 66% of small businesses don’t have a loyalty program. Those that do tend to stick to a “cookie-cutter” way of doing things that result in a “take it or leave it” kind of attitude from their customers. Amazon provides a great example of a loyalty program that works with their Amazon Prime, which offers free shipping and other perks for an annual membership fee. Woolworths have a similar program with their Delivery Saver campaign, which means customers can get 12-months unlimited delivery of their groceries for $89. If customers have already paid an annual fee in a bid to save on delivery, why would they shop anywhere else? Expand your relationships by cross-selling, upselling, asking for referrals and by being your customer’s trusted advisor. No matter what industry you occupy, if you can be an expert in your particular field, you will be likely to retain your customers providing you are willing to share some of your knowledge. Once you have built this relationship, your customers will trust you to offer insightful recommendations and will keep coming back to you.